This summer we have been on one short UK break already and we are planning another one very shortly. When we go on our holidays I really like to have as little screen time as possible - a break from the TV for the girls and from the computer for the grown ups. The plan normally is to spend as much of the day outside in the fresh air as possible but when we are at home in our holiday cottage we like to take games to play together as a family. Card games such as the exciting new Shuffle games are perfect for taking on holidays or for use when you are travelling. The new Shuffle card game range by Cartamundi features card games with lots of different Hasbro names such as Boggle, Monopoloy, Guess Who, Monopoly, Nerf, Transformers and Littlest Pet Shop. 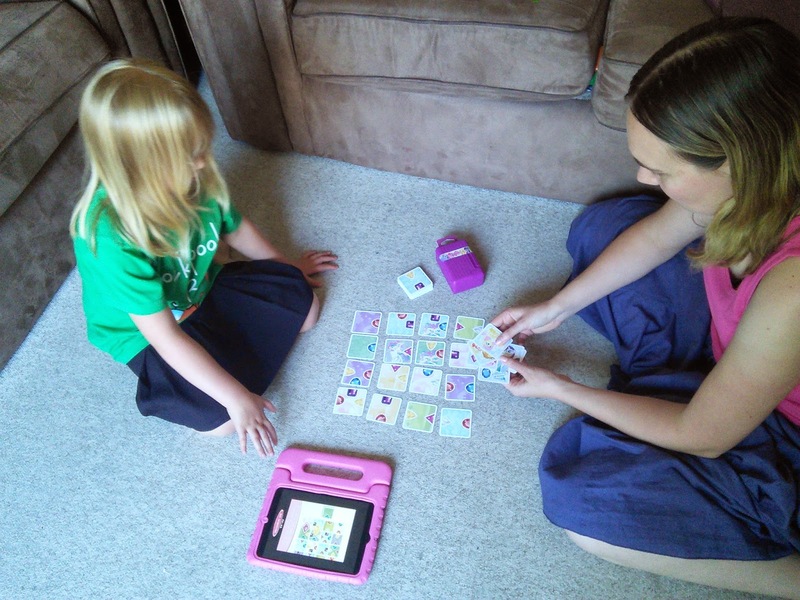 For our review we chose the My Little Pony Shuffle cards for Lara and the Play-Doh Shuffle cards for Holly. The cards each come in a travel case which snaps shut. Each game is different and each game is accompanied by its own app available on both iOS and Android. Lara's My Little Pony game has proven extremely popular and she has played it with us, alone (playing at least 4 people at a time!) and with friends. The aim of the game is to match coloured jewels for your pony. 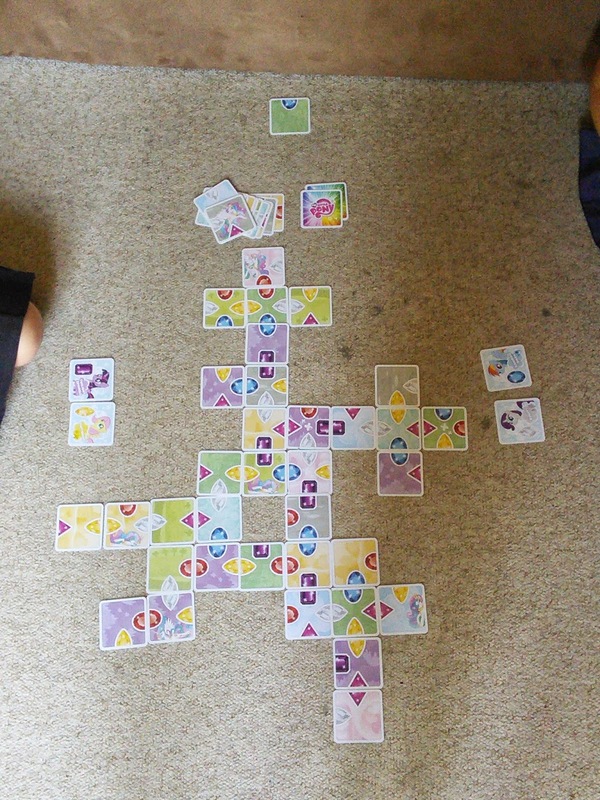 The more jewels you manage to form with your cards, the more points you get. And if your jewel cards feature Princess Celestia you get bonus points. Adding up the scores is a little tricky but the instructions give you tips. Lara likes the fact that the cards are square - it makes the game stand out. The app helps you play a similar game. The app provides music and interaction to help you set up a series of timed sessions in which to match jewels. At the end of the time, the app helps each pony (player) tot up their score. Lara enjoys the music... I find it a bit manic and pressurised! We ALL love the Play Doh card game. The aim of the game it to create innovative stories using the pictures on the cards that you have but realy you can play however you fancy playing! I really love hearing tiny Holly coming up with reasons why her card can be played - simply the joy of recognising what the picture is can sometimes bring a smile to her face. For slightly older children like Lara, the art of storytelling is a really valuable on and she doesn't half come up with some weird and wonderful tales with her play doh cards! The App adds a totally different take to things and is very interactive - the app features play-doh pots who prompt you to start a story and you each have to complete the story out with cards of your own. Occasionally you have to shake the tablet and the Play-doh character asks for a specific card or type of card and if you have that card it asks you to do something like tweet, or brrrrrm! Both games are great fun and I like the fact that you can play with or without the tablet by your side so they are brilliant games to take with us on holiday for our screen-free time.